This is a great story sent to me by Cait. Hope you enjoy it as much as I did. It has been a very lazy day for me. I worked a little on orders, but just couldn't get in the mood for much. Spent way too much time on the computer looking at web sites and blogs. ( I never, ever do this) It was actually quite fun. Wish I knew how to do more with my BLOG. Some folks have the cutest little graphics and sayings and have the most interesting articles. I'm gonna try harder to learn how to do more with it! LOL ! Would love folks to leave comments about what you think of my blog or maybe what you would like to see more of, or just helpful hints for me. The guestbook at the bottom of the page has been signed several times and I thank you so much for that. I keep pluggin' away at this and having a great time doing it. Trying to get in the habit of posting everyday & sometimes it's a little hard to do. Going back to some projects for now~~but will be back soon! It's been a cool, rainy day in K-ville today! The perfect day to stay home, have a cup of your favorite tea & curl up with a good book. Unfortunately, I didn't get to do that. I had to work on orders. And tried to "brainstorm" with a friend to come up with new goodies. A few good ideas came up-maybe you'll see them here sometime next week. Friday Favorite Finds this week is my very tall set of Shaker boxes (I painted and sponged them to look old) along with my Yarn Winder????? (I'm not even sure what it is called, but I have always wanted one & found this one not too long ago in Walnut Cove). I put together the huge bunch of flowers that is a combination of drieds, preserved & silk. This is the perfect little prim corner in my dining room. I hope to get my window treatments done for my bay window this weekend. I'll post pics when I get them finished. Meant to do this on Thursday, but was just too darn tired. Started out not feeling the greatest, but had so much to do that it really didn't matter. I knew the kids were coming over in the afternoon to bring Mums from a school fundraiser and my Mom & Dad were coming over to pick up their flowers and to see Alex and Elle. About 11:30 I decided that I needed to see my Dr. so I kinda dropped everything and left for Winson-Salem. Long story short, I came home to my parents, my daughter and her kids sitting in my driveway. A short time later, Cait shows up for lunch. And then the bestest thing of all~~~~~~~my friend Retha calls and wants to come by with one of my long time friends from the internet. Diane came all the way from Indiana with her husband and grandson. I think her hubby had business down here & she decided to come along. What a fabulous Surprise!! I enjoyed meeting her so much. She is one of the sweetest people that you could ever meet and just like I thought she would be. Wish that I would have been more prepared, but it didn't matter to either of us.~~~ We had a really nice visit together and I hope to see her again! 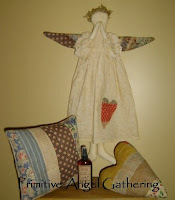 Check out her site at: http://www.aprimitivejourney.com/. First of all, the patterns and books that I had planned to sell have all been spoken for. Yipee! A couple of ladies took ALL that I had decided to part with. I am very excited about the new Fall season for network shows. So far, I haven't been disappointed with what I've seen. One of my favorites is Criminal Minds and tonite there will be a new episode! I just love the way the characters interact with each other & do the profiles. Sometimes, I think it's a little scary, cause most of the "stuff" on this show could actually happen. Today, was a little different than the past several days. I had to get back to some serious work. Didn't have time for much cleaning today. I did however, make a wreath for my foyer. I'm not much of a floral designer, but I do know what I like. It turned out just the way I wanted. The colors are so rich & vibrant, just perfect to greet my guests! More pictures of what I have been working on will be coming soon. Another beautiful day in K-ville! Still cleaning my house a little bit at a time, from top to bottom. Today, I was cleaning in my Dining Room and found all kinds of treasures! One of the most unique (old) pieces that we own is shown here. 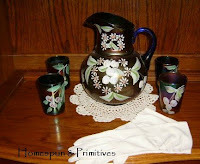 This handpainted picher set came from Bill's grandmother, Cynthie. She passed away several years ago and we have a few things that belonged to her. This is one of my personal favorites. It is so different! I ended up touching up the walls and re-arranging the furniture. I hope to get new window treatments done this week and I'll post more pics. There's a lot of old treasured pieces I would like to share. Thank goodness I didn't have to cook today! We had the leftover dumplings and I honestly think they were better than before! For the beginning of Fall, it was a beautiful day in K-ville today! Though, I spent most of it working on orders inside and doing some more cleaning. This whole cleaning jag started the other day when I was looking for my Mom's recipe for chicken n'dumplings. I couldn't find it any where and decided it was time to do something drastic!! So, every day since Friday, I have been cleaning a little at a time. It's not nearly as overwhelming as tackling it all at once. (Little goals add up fast, working every day from a list) I'm very pleased with what I have accomplished so far. I never found my recipe, but finally called my Mom and got it. We're having dumplings tonight. LOL!! They smell wonderful! Actually, the dumplings tasted better than they smelled! We thoroughly enjoyed them. And there's enough left over for another meal. Lots left to do, so until next time. Happy Sunday Y'all! I'm still finding books & patterns to add here. I have been cleaning out again and decided to sell some patterns & books. I am putting these here so you can save on shipping charges. These will all be actual charges. Let me know via e-mail shari@homespunandprimitives.com what you're interested in & I will send you an invoice thru Pay Pal. First come, first served! This was supposed to be for yesterday, but my little grandchildren came over & after they left I took a nap! LOL ! So...here it is today! Another one of my favorite finds! Found the Dough board in Walnut Cove for only a few dollars~I made the candle, the basket was my Grandmothers! I love the grouping on my kitchen counter. 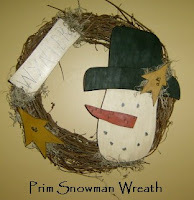 New Wreath for Winter! Too cute!! till I start adding more Christmas goodies. But, you can email me for more info. they would like to share?? I can't seem to come up with much of anything! Finally, I got to see my little text ad in Create and Decorate Magazine! The size is small, but still it is something and exciting for me. And I am getting a lot of traffic to my site from it. There I am, the very first one! This is the issue that I'm in! Lots of great projects! tea light and had to show it off! I think everyone will love the way it turned out. Wait till you see what I have for tomorrow! Take a peek at my web site to see more new goodies that I made today! At least EVERYTHING has turned green again! Today, I am working on a couple of orders, but thought I might do some more Fall goodies. I still have tons of fabric and I would really like to use up most of it. A new, larger size pumpkin ( never made this size before) turned out great. It would make a fabulous centerpiece for your dining room table. You could use it all the way till Christmas decorations come out. Look for it later today on my web site. Break is over...until next time. Just finished up this sign. Love the saying & love the way it turned out. The perfect sign for the prim family. Look for it soon on my web site! Okay, I said what I felt I needed to and if I stepped on any toes, I apologize. Let's all pray that Texas won't be hit as hard with Ike as they think and all the folks in the path will be safe. Compliments of Peggy in Alabama & Deb in NC for this great recipe! Much cooler here today with lots of showers. Every time I turned around it was raining. I spent most of the day making some new wood goodies. Hopefully, I will get them painted later this evening and have them ready to show by tomorrow. Also, working a few Fall fabric projects. Just need to get them stuffed and they will be ready for my web site tomorrow. A couple of folks are waiting on some more Fall/ Halloween Gathering sets, but it may be late tomorrow before they're ready. One set will have pillows plus a matching runner and a pumpkin too! Another new item is super jumbo size pumpkin with a crow. I have made several of these over the years, but never really offered them on my web site. Well, got to get back to work! Busy day tomorrow! The Winner for the August 2008 Contest. Linda Demoff of Corydon, Indiana, chose Mulberry room spray and grungy candles for her $25.00 gift certificate! The Miracles for Mallory Auction has started! This is my contribution for the auction. Please go look at all the wonderful items that have been donated. Today, turned out to be a really nice day in K-ville! It started out a little dreary with the rain, but then the storm soon moved on. The sun came out and it seemed like a hot, humid, summer day, instead of an early September day! FYI~~~I am extending the special for the heart with grungy candle for an extra few days. There was a problem with ordering and I want to give everyone the chance to get one if they're interested! 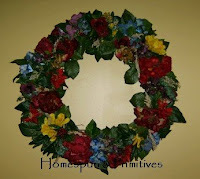 Be sure and check it out on the front page of my web site http://www.homespunandprimitives.com/. Did y'all know there is always a special for the week for 50% off?? It's a great deal and a great way to try my products. 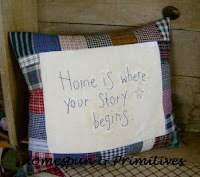 Also, Home is where your story begins pillow is this weeks special. Really cute with a patchwork border and only $7.49. Please keep in mind the Miracles for Mallory auction starts tomorrow on the 7th. There are some FABULOUS items to bid on on. I had a sneak peek today! p.s. Don't forget to enter my September Contest! Another one of my Fabulous Finds! Haven't decided where to put it yet, but I love it. Hubby says it can actually work. How Fun! Today was spent working on orders and finishing up my project for the Baby Mallory auction. I have struggled with what I wanted to make, but yesterday, it just kinda came to me and I knew what I wanted to do. I'll guess we'll see when the bidding begins! This week is flying by for me! Can't believe that tomorrow is Thursday and my youngest daughter, Cait will be 21! Happy, Happy, Happy Birthday Cait! She came in yesterday with a new Little Black Party Dress to show me. I guess she will be celebrating "Big Time" this weekend! Just be safe and remember we love you! She is so cute with her smiling face and her quick wit. 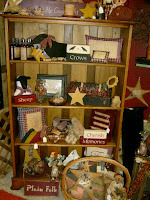 This is the store in Walnut Cove, NC where I have a booth. Thanks Kathy for giving me a space! Come see me if you can! !